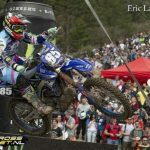 Nancy van de Ven of the No Fear Yamaha team lost the world title in dramatic fashion at the final GP of the series in France. She finished second in the first race, giving her a slender championship lead going into the final, where the title slipped out of her hands in dramatic fashion. The final round of the Women’s motocross world championship was held at Villars sous Ecot in France. The circuit was immaculately prepared, but half an hour before the first race on Saturday, a deluge turned it into a quagmire. Nancy had qualified third and took the early lead in race one with title rivals Courtney Duncan and Kiara Fontanesi in tow. Fontanesi moved into the lead, and Nancy had some trouble when she slid out. She recovered and was ready to reclaim second when Duncan also made a mistake. This gave her the championship lead. The rain did not let off throughout the night, and the track was nearly impassable. The organisers cut out part of the track. Nancy settled into third after one lap, being careful to avoid stranded riders. Nancy held her third place for a long time, which made her the virtual world champion. Alas, with two laps to go, she swerved to avoid another rider, and that caused her to slide down the hill. It took her a long time to get going again, which cost her two places and the world title. Nancy suffered a lot of setbacks during the season, but fought back every time purely on character. Alas, the drama of the last few laps dropped her to fourth in the world championship series, where she deserved so much more.